Battle of Nine Kings - The earliest recorded battle in the Bible (aside from Cain and Able) is the "Battle of Nine Kings". So named because it was fought between the kings of Shinar (Babylon), Ellasar, Elam, Goiim...and the kings of Sodom, Gomorrah, Admah, Zeboiim and Bela. Four kings against five. The Bible says that it took place in the Valley of Siddim, that is, the Salt Sea (that is, the Dead Sea). It was fought because the five kings had been vassals of Kedorlaomer, King of Elam for 12 years. In the 13th year they rebelled and tried to gain their independence. They failed. One of the consequences of the war is that Lot, Abraham's nephew, had been captured because he was living in Sodom at the time. Perhaps he had been recruited as a soldier and was taken prisoner as a result. This did not sit well with Abraham. He raised an army of his own and pursued the four victorious kings. 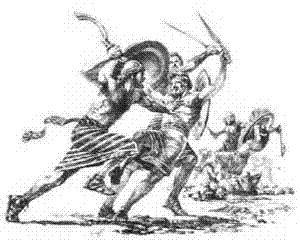 Abraham routed them (no doubt their forces depleted from the original battle) and recovered his nephew. The Bible says that Abraham's army consisted of 318 men, which gives you an idea that in these early times, armies were not very large. The battle is described in Genesis chapter 14.